We are coming to the end of my tasting notes for the whisky exchange show 2016, only a few more left. This whisky, unfortunately, was the biggest disappointment of the show for me. I’ve had some Kavalan’s before, but none have really impressed me (yes, even the Sherry Solist). 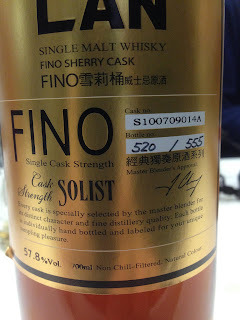 What I should have done is tried the new Solists from Port, PX, Amontillado, etc. Instead, I went for the previous top of the solist range: The Fino Sherry. Nose: Ugh. Bakery, yeasty, a very weird meaty citrus note, like rotting limes. Quite offputting. Taste: Citrus tang to start, lime, intense lemon, prickling then yeasty with a very weird oak note. Not really sure how to describe it, rotting oak fungus? Not that I’ve eaten any before. Finish: Long (Unfortunately). Unbalanced, with weird rotting citrus notes continuing. Ugh. I had a sip of this and immediately poured it away, really not for me. I hope this was just a bad batch, but I found this very very weird. It’s actually not terrible, or even bad, it’s just all over the place. But the thing that makes it the most disappointing was the price, £250 or something, just crazy.